... And then there’s the story of Col. Charles Young. In 1917, when the United States entered World War I, Charles Young, the son of former slaves, was the Army’s highest-ranking black officer. He was the only serving black officer who was a West Point graduate, and the third black man to ever graduate from the school. He served all over the world, leading men—both black and white—in and out of danger. Yet the Army still wouldn’t promote him to the rank of brigadier general because that would mean he’d be in charge of Southern white men. Even President Woodrow Wilson got involved, knowing Young was one of the best soldiers in the entire military but hesitant about allowing him to outrank white soldiers. The president, Congress and the secretary of war privately wondered what to do about the “Charles Young question.” Eventually the Department of War decided to say Charles Young was not healthy enough to serve, forcing the greatest black soldier in the armed forces to retire during wartime. That is how America solves its “black” problems. 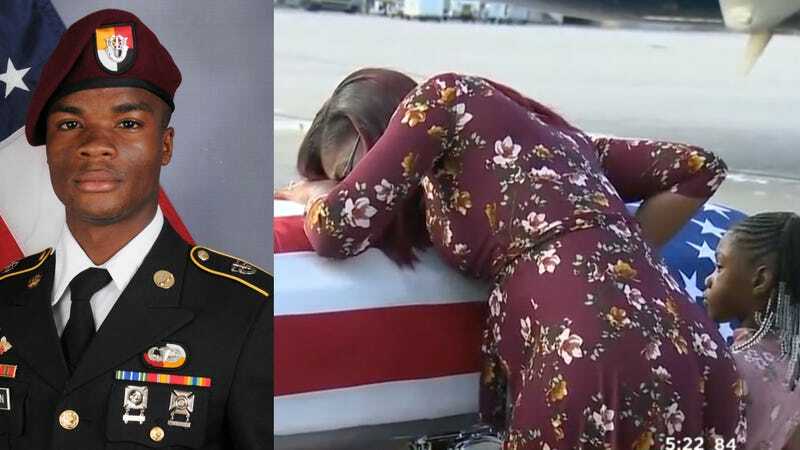 Trump denies that version of the conversation, but Cowanda Jones-Johnson, the sergeant’s mother, affirmed the account of the call and said: “President Trump did disrespect my son and my daughter and also me and my husband,” according to the Washington Post. There are other soldiers who haven’t heard from Trump. The Root can confirm that there are at least three soldiers who gave their lives for their country without acknowledgment from their commander in chief. Roshaine Brooks, an African-American sergeant in the Army, was killed in action on Aug. 13, 2017. His family is waiting for a call or a letter, even though Trump says he has reached out to the families of all slain servicemen. Spc. Isaiah Booker’s family say they received a letter but no call from Trump after Booker was killed in Jordan. The mother of Army Spc. Etienne Murphy, who was killed in Syria, says that she wrote to Trump six weeks ago to tell him she was “deeply grieving,” but she has yet to hear anything from the White House, according to the Chicago Tribune. This is the way America has always treated black soldiers. It has always sucked them dry and used the meat from their carcasses to feed freedom. The black soldier is the most disrespected, unheralded pillar propping up the tent that protects this country’s freedoms. Black soldiers are a perennial footnote. When America descended into the Civil War, the Union was preserved in part by the 209,145 black soldiers who helped defeat the Confederate States of America and end the American holocaust of slavery. The country has actually honored those soldiers with the African American Civil War Memorial in Washington, D.C. It was erected in 1998. The first group of soldiers to arrive in France in World War I was the 269th Infantry, known as the Harlem Hellcats. They spent more days in combat than any other regiment and never lost a man. An outsized number of African Americans have served in every war since the U.S. military was integrated in 1948. According to Pew Research, in 2015 (the latest year for which statistics are available), 19 percent of active-duty men and women in the military were African American, while blacks make up just 13 percent of the U.S. population. It is not simply the sentiment of a man who equivocates about “both sides” regarding white supremacist terrorists. Soldiers don’t fight for recognition, but America never recognizes black heroes. There are no movies or mentions of buffalo soldiers. Textbooks don’t tell the tale of the Tuskegee Airmen. This is the country that turned Colin Powell into a punching bag. It drinks black blood and pisses out red, white and blue. When the Army declared Charles Young unfit for duty, he said: “It’s time for my people—my brethren—to know that I am physically fit.” Then he packed a bag, put on his uniform and—in a move that would have killed much younger men—the 54-year-old rode his horse 500 miles from Xenia, Ohio, to Washington, D.C. When he reached Washington, D.C., he marched into the office of the secretary of war, who had no choice but to reinstate Young. But he never gave Col. Young the generalship he deserved. Instead, he sent him to train other black soldiers, and then to West Africa, where Young eventually died.